Michael Harken lives in Utah, USA. At the beginning of my mission, I served in a small city in South Korea. One rainy day we had not had a lot of success but wanted to keep working until it was time to go home. My companion and I decided that we would knock on a few more doors. At one door a woman answered, and my companion started talking to her. As a new missionary, I had a hard time understanding, but after a few minutes she began speaking to us in English. We found out that she was from Chicago, Illinois, USA, and had moved here with her family. Her husband was a preacher for a church that did not have friendly feelings toward our beliefs. 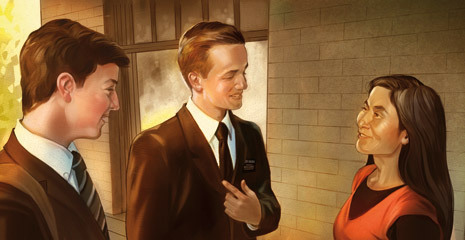 The woman was nice but eager to disprove the Book of Mormon and convince us that our church was incorrect. I stood there with my companion as he tried to answer her difficult questions. My companion tried to testify to her that the Book of Mormon is true and that it could help her, but she insisted on believing that he was incorrect. After about 30 minutes of discussion at the door, she asked my companion, “Where will we go after this life?” I could tell she was eager to refute my companion’s teachings, as she had before. My companion testified of the plan of salvation and that we can live with our families forever in the celestial kingdom. Before he could continue, she stopped him and asked him to repeat what he had just said about families being together. He again replied with the same response. I felt the Spirit so strongly, and I could see in her eyes that something had touched her deeply too. After that short but powerful testimony, she stopped arguing with us, took a Book of Mormon, and asked us to come back to talk with her and her husband about the Book of Mormon. I remember walking home with my companion that evening, amazed by the effect of my companion’s testimony. I understood then that a testimony accompanied by the Spirit is the most powerful teaching tool we have. I’ll never forget my companion and his testimony that night. After that experience I decided that, even with my limited ability to speak Korean, I would try to bear my testimony no matter what. As I did, I began to feel the Spirit more and more. I learned that the best communication happens when you teach by the Spirit.